NoClone is a powerful file management utility to find out and remove duplicate MP3, duplicate photos or other duplicate files. Besides saving valuable local hard disk space, removing duplicates will also help to manage file well, speed up file indexing. Why is NoClone a TRUE duplicate file finder? By True Byte-to-Byte Comparison ,NoClone finds out the TURE duplicate files which are exactly the same in content, instead of FALSE duplicate files. Why is CRC or MD5 not reliable? 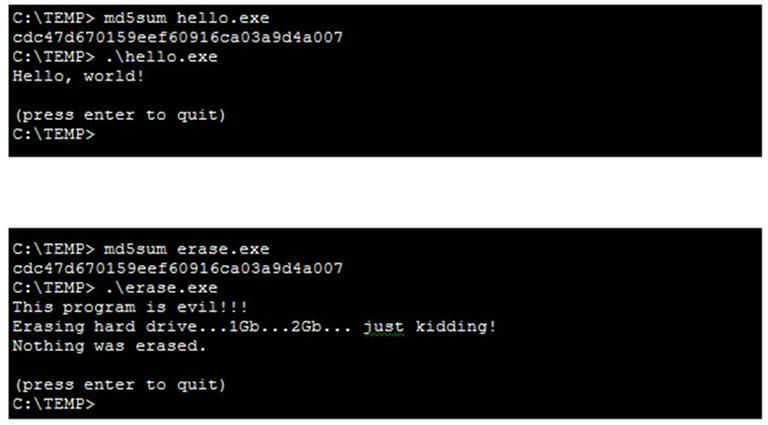 Here are two files with same MD5 hash value (cdc47d670159eef60916ca03a9d4a007)*,which are judged as duplicate files by MD5 comparison. Therefore, by CRC or MD5 comparison, it can’t be a TRUE duplicate file finder. Comparing exact content is the only way to ensure 100% duplicates and NoClone has realized that. How does True Byte-by-Byte comparison work? Still efficient! Some may argue that by Byte-to-Byte comparison, comparing file is slow and inefficient. However NoClone, a true duplicate file finder, optimized it to an efficient algorithm. NoClone filters suspected duplicate file with same file size and type, from which blocks of data is read and compared. Duplicate file is matched with all blocks. With the above comparison algorithm, each file is opened once for comparison, which works as MD5 hash comparison. Windows Vista /7 Works with Vista / 7 ? There is no need to buy a new hard drive. Just bring it home, only US$29.9 for Home Edition and US$79.9 for Enterprise Edition.